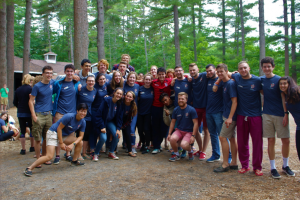 We caught up with Lauren Bullen, who went to Camp USA as a Camp Counsellor last year, and she’s here to tell you everything you’ve wanted to know about it. Take it away Lauren! I think it’s fair to say that most of us grew up watching cheesy American movies about kids having the time of their lives at summer camp. The Parent Trap and even Camp Rock spring to mind. The stunning lakes, giant trees and quaint cabins looked surreal, like something that could only exist in such movies. 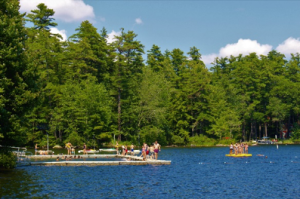 However, these places do exist and I spent my whole summer living the camp dream as a camp counsellor in YMCA Camp of Maine. I must admit, it was a big step for a quiet, Irish girl like me to move to America but it’s safe to say I adapted to the life very well. It’s hard not to. I immediately made friends for life. Everyone was friendly, eager to get to know everyone and excited for the summer ahead. 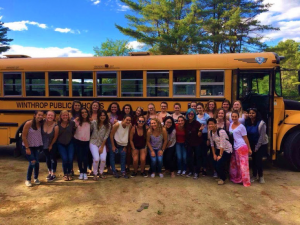 The friends you make at camp are special because you share unique memories and inside jokes that nobody else in the outside world could ever possibly understand. Day-to-day, camp was hectic but in the best possible way. I loved every minute of it without a doubt. Even in the early hours when our alarms would ring I still felt excited to be there. 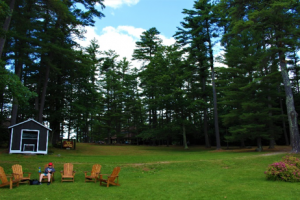 We woke the kids and headed straight through the forest to Chapel, a hidden seating area where all of camp would gather. It was led by someone who had an encouraging message to share and was a chance to start the day on a positive note. 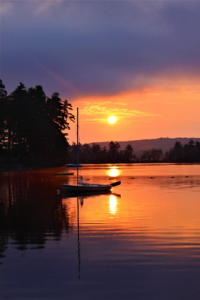 Whether it was a story, a poem or an important lesson to learn, it enforced a positive attitude towards the day ahead. The American flag was then raised at the lakeside as we watched in silence. 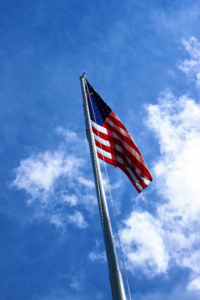 This was a great experience for all the international counsellors because it gave us a sense of American culture as patriotism was clearly important to them and the process was always treated with respect. Songs were then sung, as they were before every meal. 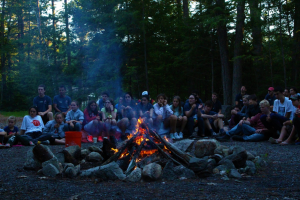 The songs were one of my favourite aspects of camp life. 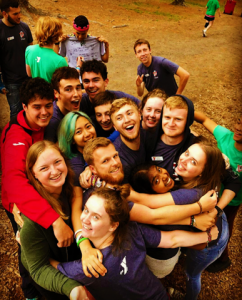 Even though I am by no means a good singer, I put all the enthusiasm I could into the songs and their actions, which created some of the funniest and most enjoyable memories I have of camp. I may have left camp but the songs will never stop playing in my mind. “Baby shark doo doo doo doo doo doo” – a song that is now viral was sung often in camp, proof that camp songs are catchy. To the dining hall then for breakfast – my favourite meal of the day. We were fuelled with pancakes, waffles, bacon, sausages, breakfast muffins, monkey bread, cinnamon rolls – all the typical American breakfast foods you could dream of. Throughout any meal during the day, someone would often shout “hey rah rah” – a phrase that was understood to mean that they would start singing a song and everyone would join in. The feeling of being part of those dining hall singalongs is a feeling I will never forget. The atmosphere created when the entire camp joining in on a song together is unbelievable. We sang hits like Don’t Stop Believing, The Cup Song, Build Me Up Buttercup and Party in the USA. It was like a scene from Camp Rock. Camper Duties were next in the routine. It was important to encourage all the kids to work together in making the camp environment more enjoyable for everyone. It also taught the kids to clean up after themselves as there was no one to do it for them. As awful as it sounds, cleaning the bathrooms was always a group effort and it was nice to see campers helping each other out with enthusiasm. Periods 1 and 2 were next on the timetable. Counsellors would teach classes to the kids which signed up for their activity. I was always found at either the archery range, as I was a qualified level 2 instructor (another amazing opportunity camp provided me with) or in the arts & crafts shed, also known as the Glitter Palace. 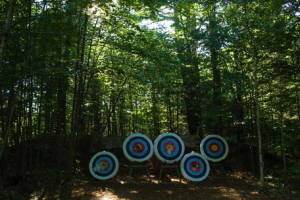 Even though there were a few near-death experiences, involving 8 years holds with bows and arrows – sometimes not a good mix – I loved teaching archery. It was such a unique sport to be involved in, one that I rarely got the opportunity to do before, but for 8 weeks I got to teach it almost every day. It was a very satisfying feeling when one of the kids hits the bullseye and looks so proud of the new skill you taught them. I felt most at home in the Glitter Palace. Here I taught various types of arts & crafts such as painting, pottery, bracelet making and my favourite tie dye. 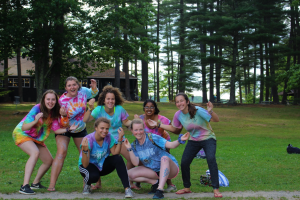 By the end of the 8 weeks everyone had a tie dye t-shirt, both campers and counsellors, making the camp very colourful to say the least. Tie dye was my speciality so I built up quite a collection during my time in camp… one for every Tie Dye Tuesday! After periods 1 & 2 came more songs and lunch, followed by Camper Time. This time allowed the kids to do whatever they wanted for an hour while us counsellors kept watch at our allocated stations and played games with the kids. There definitely were plenty of friendship bracelets made! Everyone always had one in the making and wrists were covered in them. It was probably the best skill I learnt in camp and gave me the best souvenirs. After camper time, period 3 and 4, more songs and dinner followed. Evening programme brought the whole camp together in different activities each evening. 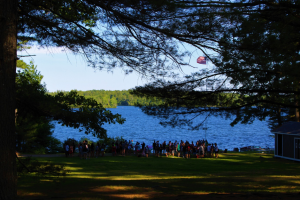 Whether it was a game on the sports field like bucketball, pirate ball, capture the flag, or Olympics… in the auditorium for counsellor auctions, lip sync battles or discos… or a camp wide activity like counsellor hunts, campfires or a zombie apocalypse. It was fun chaos to say the least and my favourite time of the day. The dancing around campfires and running away from fellow zombie counsellors during the apocalypse were the highlights. Evening programme was a chance to engage with the whole camp and sometimes make a fool of yourself onstage which turned out to be more fun than I would have thought. 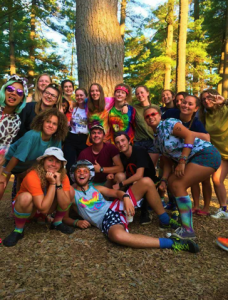 Camp is a place where everyone can dress crazily, act the fools and laugh about it with friends. And so, came the end of the day for the campers. Everyone gathered in a circle and sung the goodnight song before retreating to the cabins for Cabin Chat. 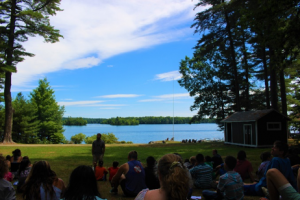 Campers and counsellors sat together and reflected on their day, keeping the message from Chapel in mind, as a way of rounding off the day. Roses and Thorns was a common discussion during Cabin Chat. Each person would take turns to talk about their favourite part of the day – their Rose – and their least favourite part of the day – their Thorn. Staff time gave counsellors the well-needed time to relax. 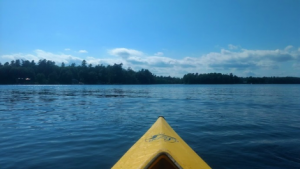 It was mostly spent on social media – even though I found myself much less attached to my phone, it was nice to catch up on the events back home – or doing laundry, apart from when a new episode of Game of Thrones had come out – that always took priority. While most counsellors relaxed in the staff house, a select group of counsellors had to go On Duty. 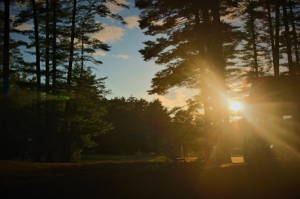 This meant wrapping up blankets, covering yourself in bug spray and sitting outside the cabins to make sure the campers were asleep and safe. 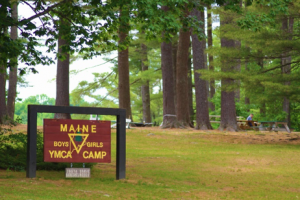 This is where the majority of my weird stories of camp come from – chasing fireflies, hearing ghost stories and dealing with sleep walking kids – it gave the camp a somewhat spooky atmosphere at night. However, the most important part of staff time though was staff snack… hopefully a famous Seadog Biscuit!